profile August 9, 2016 8:00 a.m. The Anglo-Italian artist is not hugely concerned with conventional labels. 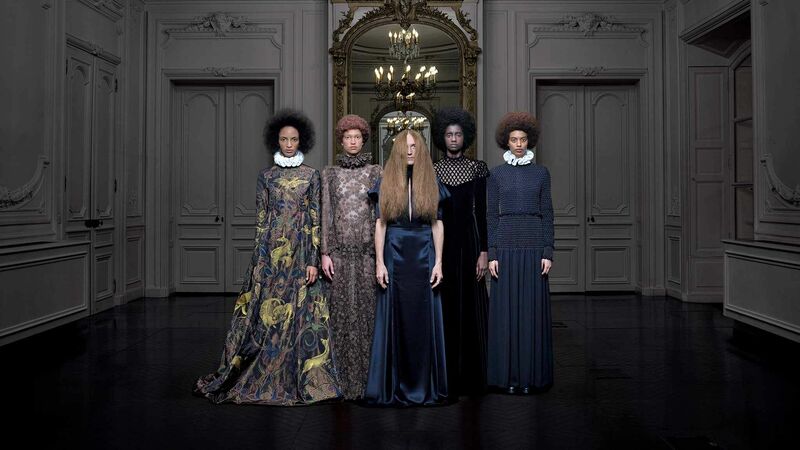 For Vanessa Beecroft, longtime Kanye West collaborator, people are the perfect palette. 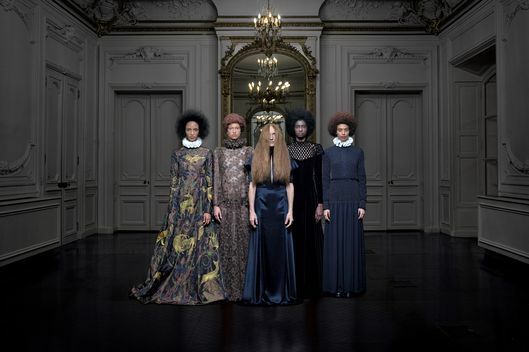 Beecroft with models wearing Valentino Haute Couture on set for Italian Vogue. Beecroft’s studios open off a modest courtyard behind a big wall in a Mexican section of East L.A. Inside, she is wearing a white lab coat over black leggings and T-shirt, her hair in a bun. The effect is serious, and Beecroft is being serious — as she tends to be. She is open and direct when she speaks, describing her childhood, her relationship with her father, and her feelings about the art world with an earnest, unguarded romanticism. Nothing feels off-limits with her, and you also get the sense that she has never read a magazine or watched a television program. But she is not exactly a recluse. Despite her claim that she “withdrew from the art world” almost six years ago, Beecroft occupies an uncanny, distinguished space both between and above the newly adjacent art and fashion universes. At 47, she has become something like the high priestess of the strange, entitled dreamworld that floats above all the art fairs and the fashion shows, where spending countless dollars on performances involving thousands simply for the sake of beauty is considered not only normal but admirable. She appears unaware of — or at least unconcerned with — the debates and discussions that captivate most members of these industries (and their critics). Nor is she preoccupied with political correctness, and in fact seems to enjoy blithely poking at its taboos. For all of this, she owes a lot to West, and their collaboration, even if the credit most regularly seems to flow, in that relationship, in the other direction, with West suggesting Beecroft has helped elevate everything from his wedding to his music videos to the exalted status of art. The collaborations have a very distinct style, which you could call imperial naïveté. They are large-scale spectacles that make ideologically slippery use of bodies, race, and gender. 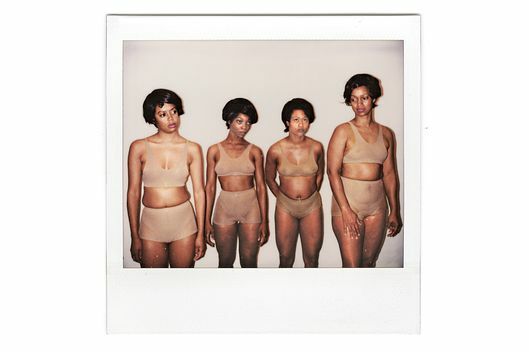 In West and Beecroft’s hands, these potentially radioactive subjects are treated as simple aesthetic choices (in “Yeezy Season 2,” the models are grouped loosely by skin tone, reduced to something like human Pantone chips), used as supple metaphors of personal struggle and spiritual yearning. For the politically conscious, this is a complicated trick to pull off, but to hear Beecroft tell it, it’s all just poetry. Soon after, Beecroft and her husband, photographer Federico Spadoni, became full-time employees (she’d previously masterminded some things like a short film in which Selita Ebanks plays an elaborately feathered bird who is asked to eat a similarly feathered relative at a banquet). 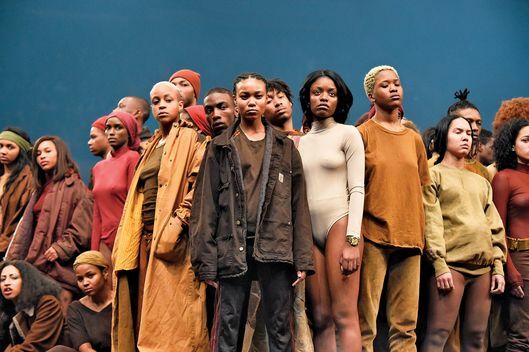 Beecroft has collaborated with West on all of his Yeezy fashion shows, but the most notable was the performance she orchestrated at Madison Square Garden for “Yeezy Season 3” featuring some 1,500 people dressed in dyed clothing (from Adidas and thrift stores) in a re-creation of a photograph taken of refugees escaping the genocide in Rwanda. “That was a random pick,” she says. “The image came out of one of my books, and I thought, Perhaps this is Woodstock, because it looked really fashionable and glamorous, but no. That was a refugee camp … I wanted the people to look poor. Poverty and elegance were the key words. Poverty and elegance. No trends, no fashion. Real poverty, what you encounter when you travel to Africa, Mexico, those countries where people wear their clothes with dignity and they look elegant and they look like they have intelligence. When we were casting, I said, ‘Please don’t have anyone who looks stupid. Or fancy. Please. Classical, poor, and elegant.’ ” It has been called the most viewed piece of performance art in the history of the medium. But earlier this year, right around the time West was tweeting about his debts, Beecroft was removed from his regular payroll and placed on a project-by-project basis (“It was Kim Kardashian,” she says. “She cut everything out.”) That’s okay, though, she tells me: Now she can recommit herself to her own work. Which she has already begun, despite her reservations about the art world and her conflicted feelings about fashion and popular culture (she says she has “no interest”). This past season alone, Beecroft created an installation for Tod’s in Milan and another for Valentino’s popular “Rockstud” collection: In each, models wear the house’s clothing while standing in Beecroftian arrangement. (Both also feature celebrities: Karlie Kloss in the case of Tod’s, Alessandro Nivola and Emily Mortimer for Valentino.) She has begun a large sculpture project — having cast enormous women in both bronze and marble, she’s now molding them again in clay, this time from memory — that she plans to show at her husband’s new L.A. gallery in October. As for popular culture, she’s working on “a Barbie doll project” for Mattel. Perhaps some of them will have “caramel Beyoncé skin,” she says, acknowledging murmurings (including from her husband) that Beyoncé’s “Formation” video owes her some creative debt. But she doesn’t get into any of it too deeply, she says, because she has only the vaguest idea that someone named “Beyoncé” actually exists. Beecroft speaks softly and musically with an Italian accent and has pale, freckled skin and long, curly red hair. She is beautiful like a painting: a Botticelli, maybe, and her affect is childlike: wide eyes, eyelashes batting, a posture of innocence. The words she uses more than any others, the qualities she most exalts, are gentle, classical, and poetical. (According to Beecroft, Kanye West is all three.) Her ex-husband, Greg Durkin, has recently sued her for full custody of her two older children (Spadoni is the father of her two younger children), and she is rattled one morning when she arrives for our first interview at the studio. “I do not understand this,” she says. “I am 200 percent maternal, and until they are taken care of I cannot think of anything else. It’s really compulsive. My children are a totally different experience: completely human and natural and primitive. It is beautiful, and it is the first time I experienced real life.” It’s an unusual place to start a conversation. (“Vanessa is very worldly, but she’s also in her own world,” says Jeffrey Deitch, who discovered Beecroft and invited her to the United States 20 years ago.) Obsession and compulsion, it quickly becomes clear, are common themes with Beecroft — they touch every part of her life. When she focuses on something, the engagement is complete, which may explain how prolific she’s been. Since 1993, she has produced 75 performances around the world. “Hardworking” doesn’t seem the correct way to describe the way she works; “full-body possession” is more like it. It wasn’t the happiest childhood. As a late-developing teenager, Beecroft was given growth hormones, which she found traumatic, and she was later hospitalized for overeating specific foods: nutshells, flaxseed, and clay, for example, because she had heard they would cleanse her system. “When I see Grey Gardens, I am reminded of the dynamic,” she says. For Beecroft, her work was a kind of ridicule back, with the women put forward as an aggressive affront to the audience, daring the spectators to watch their own unease — to confront it, and to consider her own internal panic made flesh. She enjoyed the audience’s discomfort, and if viewers’ thoughts turned sexual, she enjoyed watching them squirm. He began to represent Beecroft, finding benefactors for her performances and selling large-scale photographs of the events, which created a commercial market for her work, a nearly impossible feat for a performance artist. Of course, it didn’t hurt that Beecroft is quite beautiful and fashionable. So she became one of the artists anointed “interesting” by fashion. It makes sense: Both Beecroft and the fashion world are obsessed with women on display; both puzzle over the meaning of the addition or subtraction of a shoe, a stocking, a wig. In 1998, the Art Production Fund’s Yvonne Force Villareal arranged for Beecroft to collaborate with Tom Ford on a massive show at the Guggenheim. For that project, Beecroft cast women with model-type bodies, a departure for her, and the result was far sleeker than anything she had done before. The women who were not naked wore Tom Ford–designed Gucci bikinis, and everyone wore stiletto heels. A few years later, she met a man named Greg Durkin, who worked in media research; he was outside her Williamsburg loft apartment in a great big coat, and he had a profile she considered classical. His nose, she says, was big in all the right ways, and the coat was the kind of thing a Russian intellectual might wear. They married. She quickly became pregnant, and began to find the city oppressive. After September 11, she retreated with her family to Cold Spring Harbor, a small town on the North Shore of Long Island, where Durkin was able to find a glass-wood-and-steel house on a pond with an Olympic-size indoor pool where Beecroft could swim the laps that had become compulsory for her mental health. It was a peaceful period in the forest: She found a yoga studio, took a lot of long walks, and felt she was giving her son, and the son who followed four years later, a bit of the magic she had experienced in her own Italian youth. “An uncontaminated childhood,” she says. Beecroft decided that she would make a film in Africa. Deitch advised Beecroft to skip it. She says he told her it wasn’t her issue and she should avoid it; he says he gave her more-conventional career advice: Her work was on fire, and such a profound shift could stop her momentum and would almost certainly conflict with existing commitments. Driving to pick up her son at school in her large ’80s Mercedes coupe, Beecroft looks, with her giant Céline sunglasses against a backdrop of parched and thirsty hills, like I’ve always imagined Maria Wyeth must have: beautiful and haunted, displaced among the cactus and the clog of the freeway. She is talking about her divorce, which she still can’t quite fathom. “He divorced me for nothing,” she says, “nothing!” She worries about her children getting enough nature in their lives, about the parking lots at L.A. schools, where kids play outside beneath a punishing and relentless heat. She longs, always, for the cool forests of her childhood. These days, Beecroft and Spadoni live in a house they call their “favela.” It is at the top of a series of winding roads just below the HOLLYWOOD sign. Beecroft is proud of the house, which has very little furniture and very beautiful, dramatic views, even on a smoggy day when everything looks like your glasses have fogged up. It is hard, she explains, to furnish when your attention to detail is so profound. In the kitchen, a housekeeper in an apron is washing dishes at the sink beside large, immaculate bowls piled high with peaches and apricots. “A huge amount of food comes into the house,” Beecroft explains. “For Federico, this is irrational. But I have to see the food in there, but it is too much and the food goes bad. But it is so the children can eat apricots, peaches, cucumbers. Celery, nuts, almonds. Grapes. Berries. I always think to myself: This is not more than we need, but then the moment it arrives, I start panicking: Is it going to go bad? What do we do? What do we do with this food?” Beecroft doesn’t eat much of it herself, particularly if the children are not around. She relies on powders, briefly including a protein powder that a nutritionist told her would help ground her to the Earth; she’s since given up on protein entirely. “I realize I am a bit floating around in the sky,” she says.